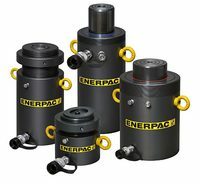 With increasing demand for heavier lifts in harsher offshore environments, Enerpac has risen to the challenge with a new range of high tonnage cylinders. The Summit Edition cylinders offer outstanding durability, longer service life, and greater side-load resistance for increased heavy lift capability. Enerpac confirms its leading position by offering the broadest product portfolio in the market. The range consists of single-acting, double-acting, lock nut and low-profile hydraulic cylinders from 50- to 1000-tonne. The Summit Edition design includes advanced bearing and sealing technology to extend the boundaries for eccentric loads, and reduced cylinder maintenance intervals. The effects of corrosion and scoring are no longer a concern because of a nitrocarburisation surface treatment. Safety has long been a major feature of Enerpac cylinder designs. Mechanical securing of the load, side load absorption, an overflow port and safety valve, are industry-leading safety features of the new Enerpac cylinders. In addition, safe and easy handling is ensured by certified lifting eyes, collar thread and base mounting holes. While improving safety features, the Summit Edition also defines a new durability standard. With longer service life, reduced maintenance, and superior side-load capabilities, users can confidently take on the most demanding heavy lift applications.